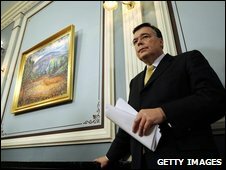 Icelandic Prime Minister Geir Haarde has called an early general election for 9 May, adding that he will not stand again because of a throat tumour. Mr Haarde plans to have surgery abroad following a medical examination that revealed the malignant growth, he said. He said a new chairman would lead the party in the elections. There have been several protests against the government since October, when Iceland's financial system collapsed in the global credit crunch. On Wednesday, angry protesters surrounded Mr Haarde's car outside the government building in the capital Reykjavik, banging on the vehicle's windows and pelting it with eggs. "I have decided not to seek re-election as leader of the Independence Party at its upcoming national congress" in March, Mr Haarde told a news conference on Friday. "On Tuesday I was informed that a biopsy had indicated that the tumour was malignant," he said. Mr Haarde's heads a coalition government with the Social Democratic Alliance which, having been formed after elections in 2007, was not legally required to call a general election until 2011. But the government has come under increasing pressure as it struggles to get its banking system working again following the nationalisation of its biggest banks in October.